Cuba's President Miguel Diaz-Canel, who went to visit the scene, said there was a "high number" of casualties. "There has been an unfortunate aviation accident. The news is not very promising, it seems that there is a high number of victims," Diaz-Canel was quoted as saying shortly after visiting the scene. Diaz-Canel said nine crew members were believed to have been on board, in addition to the passengers. Airport sources said the jetliner was heading from the capital to the eastern city of Holguin. State television said the airliner was operated by a foreign crew, but gave no details. 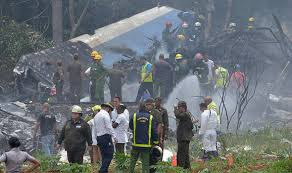 Reports said European airline Blue Panorama had been leasing a 737-400 plane to Cubana de Aviacion for several months.